A high-quality product or service: customers want more than what they are paying for; they need to see how the product/service can make their lives easier. Information is correct with no biased opinion: When people agree with the content and/or general information that is being presented by the company, they see how the brand “gets them” and makes them feel more secure in buying anything from them. This should not be abused in order to get many people to buy products since it can backfire in the long run. The company is transparent: In a world where Facebook has problems regarding the type of data they store, people have been getting skeptical about brands in general and they appreciate when companies show their true colors form the start! It will always be better to have a smaller group of people who love your brand than a big group who think it's OK.
We are living in a world where authenticity and trust are at an all-time low with famous companies like Facebook and Huawei having problems with keeping everything as transparent as possible; this means that people now think twice before buying a service or a product online. If your website and/or product images look low-quality then people will prefer to search in another page before purchasing anything on your site; it doesn’t matter if your product is better and at a lower price. While it may seem that most of these aspects cannot be addressed with the help of graphic designers, they can actually help with this and much more. Like we talked about in the beginning, dropshipping businesses need to present themselves in the best way possible in order to sell and that is exactly what graphic designers can help them achieve! They can show how good your product/service is by showing it in an innovative and unique way that draws the attention of potential customers. Red grabs the consumers' attention and people associate it with prosperity/success. A perfect example of this is Coca-Cola. Orange, like red, looks to bring the consumers' attention towards it but with a sense of freshness and youth. A prime example could be Nickelodeon. Yellow is generally linked with creativity, happiness and becoming your best self. Ferrari have been using it for decades now. Green is thought to be a color related to nature, well-being and safety, meaning that most organic food brands are likely using green somewhere inside their branding. Blue is a color everybody likes since it makes people feel respected and confident. Facebook uses blue in all of their designs and is the biggest social media brand around. Purple looks to bring in an air of elegance and sophistication which other colors (excluding black) can’t achieve. Hallmark is a high-quality brand that uses this color. Black evokes strong emotions and is seen as sophisticated and serious. High-fashion brands like Chanel and Dolce & Gabbana are a prime example. With the right information (given by your brand) they can make designs that suit your company and industry without having to completely change the brand into something you don’t want, while also keeping it 100% transparent to your customers. 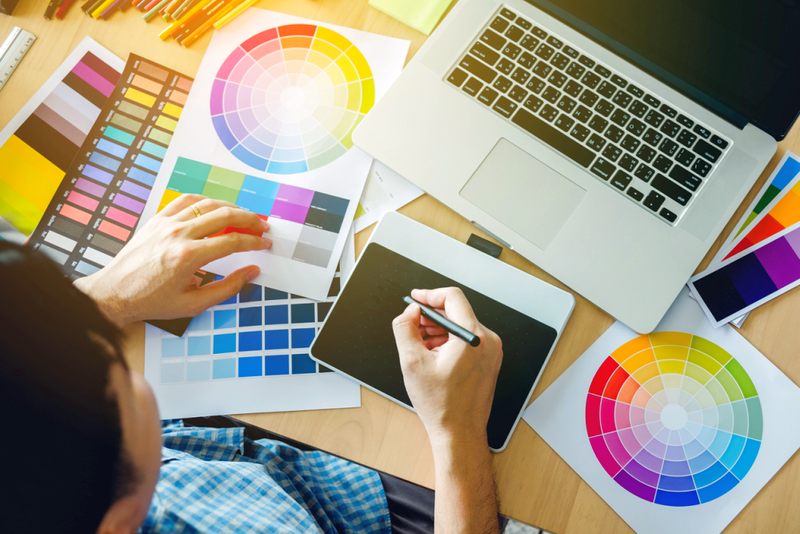 Most people don’t know of all the power graphic designers have and how much they can help a brand, especially if the brand relies heavily on their appearance to sell! You may be thinking of how expensive graphic designers are, and we are not going to lie, most high-quality designers charge a pretty penny in order for them to create a piece tailored to your business. If you don’t have the budget (or don’t want to spend that much money) you can still find designers that can offer most of what those high-quality ones bring to the table, only if you know where to look for them. We have a few websites where you can find good designers with awesome prices — the only catch is that you have to put in the time to find them. The 3dcart Experts directory includes a comprehensive list of eCommerce website designers. If you want to see in detail what the designer has done before even reaching out to them, then you can use Dribbble. There are websites like 99designs (which you've probably heard of before) where they help you connect with different designers, but it can get expensive FAST. You can also find an agency which can guide you through the process of creating your designs. Generally, it’s the most expensive option of the bunch since you will have a team of designers doing the work, but there are occasions where the agency doesn’t charge thousands of dollars for a graphic designer service. If all of the above places fail, you can still search inside of an online marketplace like Upwork or PeoplePerHour. Although most people there won’t offer the same quality as the sites mentioned before, they can still make good designs! Best of all, it’s inexpensive. These are some websites that we consider to be amazing when it comes to finding hidden gems but there are other thousands of them with designers waiting to be discovered! Not to mention the number of designers that show off their work via social media. Dropshipping is becoming a hard business model to run successfully due to the lack of trust people have in new companies, but with the right eCommerce website design, content and customer support to guide them throughout the process, it can become a pleasurable experience for them. At the end of the day, you have to bring something to the table that the brand manufacturing the product doesn’t, otherwise why would people prefer to buy it from you? Trust can be the secret weapon that can give you an advantage over other businesses, but you need to put in the time and effort into working with a graphic designer (or a whole team of them) so that they can help you build that trust via images and designs.